You can grow a drought-resistant, low-maintenance carpet of green while being kind to the environment. EVERYONE WANTS a lush, green lawn. But if you need to use conventional pesticides and fertilizers to do it, are the health risks and environmental costs too high? Peer-reviewed studies have linked pesticides to medical conditions including Alzheimer’s disease, autism, and birth defects, while fertilizer use has been tied to several cancers, as well as to respiratory ailments and heart disease. The Environmental Protection Agency advises using these chemicals responsibly, while the US Fish & Wildlife Service suggests “changing the way you care for your yard” to protect animals and waterways. Homeowners (or the companies they hire) typically over-apply products. 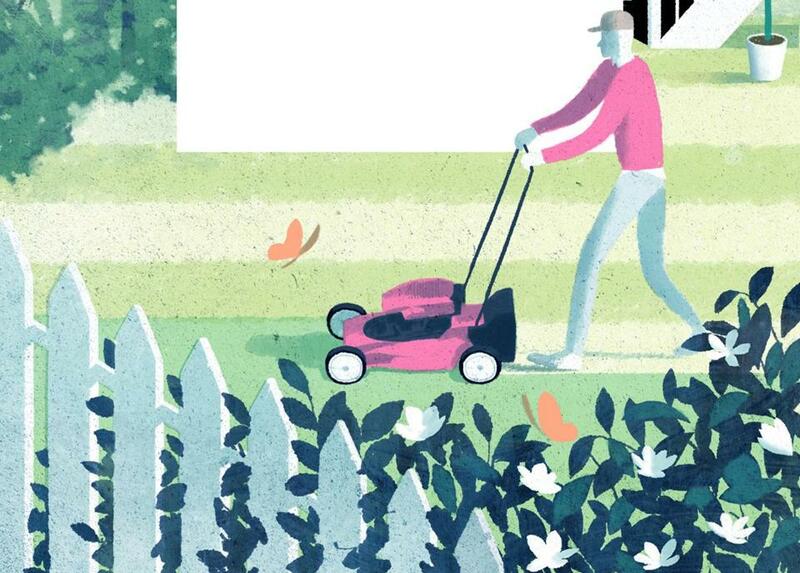 The average lawn gets up to 10 times as much pesticide per acre as farmland, and some chemicals can persist in the environment for up to 250 days. As for fertilizer, because soil can’t retain the excess, much of it never makes it into plant tissue; instead, it evaporates or is washed into lakes, bays, and harbors, where it contributes to algal blooms that harm or kill plant and animal life. And the nitrogen, phosphorous, and potassium that make up commercial NPK fertilizers take a lot of energy to produce and themselves release greenhouse gases. Using more environmentally sensitive methods — whether you’re filling in bare patches, covering an entire lot, or maintaining established grass — can deliver a gorgeous lawn, and it’s easier than you might think. 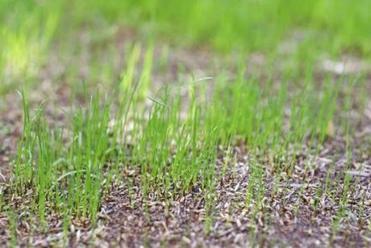 Peter DiClemente of Pure Lawns in Newton recommends planting a blend of seeds. The next step, whether you’re seeding or not, is to aerate . “It relaxes the soil so it can act more like a sponge,” DeLacy explains. He recommends using a core aerator to remove plugs of dirt about a half-inch wide and 4 inches deep. Spike aerators, including the “shoes” that attach to your regular footwear, are less effective, DeLacy says, because they create shallower holes and compact, rather than remove, dirt. Aerate in the spring and fall when the soil is moist from rain or watering. If you’re using a manual core aerator, which costs less than $30 at hardware stores, insert it with every step you take in rows across the lawn. Manual aerators can be “troublesome” to use, DeLacy admits, because they can get clogged with soil and need frequent clearing, but they don’t pollute and are easier to handle than the gas-powered variety; walk-behind models can weigh almost 300 pounds. If you have a lot of acreage, however, you might want to choose gas even though it’s less green. The machines can be rented at The Home Depot for $89 a day. DeLacy recommends a layered process for planting. Cover your first layer of seed with a half inch to an inch of organic compost or compost-soil mix, then seed again. Finally, use a roller — you can rent one at The Home Depot for less than $20 a day — to tamp down the soil, and then water, water, water. DeLacy recommends using a timer system to sprinkle around 5 a.m. and 5 p.m. until the grass is about 3 inches high; if your yard is especially sunny, add a third watering at about 10:30 a.m.
Compost provides beneficial nutrients for your lawn. DeLacy and DiClemente both recommend getting organic compost from a nursery or landscape supply house, but Lauenstein points out that that requires some “heavy lifting” to spread. He uses Plant-tone organic plant food, which contains low amounts of nitrogen, phosphate, potash, and calcium, and he spreads it generously. “Any kind of certified organic treatment will do,” says DeLacy. Most people start out buying compost, but for advanced organic gardeners, “the best thing is to generate it yourself so you know what you’re getting,” according to Jay Feldman, executive director of Beyond Pesticides, an information and advocacy clearinghouse in Washington, D.C. To create compost suitable for a lawn, toss green yard waste (such as leaves and clippings) into a composter you’ve made yourself or purchased from the hardware store for $49 to more than $400. Reserve food scraps for compost used in a vegetable garden. Many websites give instructions for making your own compost tea. 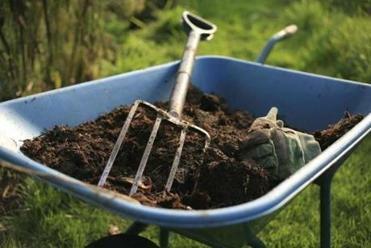 At a depth of one-quarter to one-half inch, you’ll need a cubic yard of compost to cover every 650 square feet of lawn. Water it, and within a few days you won’t even notice it’s there. 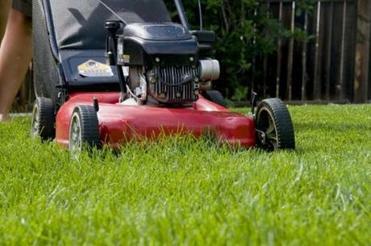 Keep lawn mower blades sharp; dull ones tear the grass, weakening it. Cool-season grasses suited to Northern states grow most vigorously in the mild, wet weather of spring and fall, and go dormant in the winter and the hottest days of summer. During growing times, mow once a week when the grass is dry, keeping the grass 3 to 3 1/2 inches long. “Most people keep their lawn at 2 inches,” says DiClemente, “which creates a lot of problems in an organic lawn.” Longer grass shades the soil, reducing evaporation, keeping it cooler, and lessening its need for water. Finally, invest in lawn mower maintenance. Check the machine’s oil occasionally and have the blades sharpened once or twice a year; dull blades can tear the grass rather than slice it cleanly, which can turn it a yellow or brownish color and make it more susceptible to disease and drought. The ideal time to water is from 5 a.m. to 8 a.m. Don’t water in the heat of the day, DeLacy says; the water will evaporate in the sun. You should never water at night, either, he says, because it can encourage fungus, which appears as brown or gray patches that might be fuzzy-looking, or as a silver coating on the blades of grass. 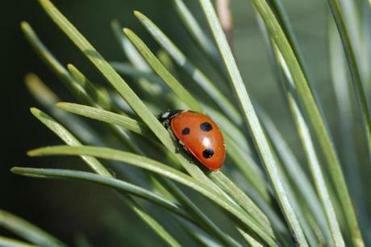 Adding ladybugs to your yard can help combat pests. If there are only a few weeds, the best way to handle them is simply to pull them up; doing it when the soil is moist will make the job easier. Depending on soil test results, a thin coating of lime may help, too, since the vast majority of common lawn weeds are linked to a lack of calcium. Crab grass, with its wide, flat blades and spreading stems, is a special case. “It’s different from other weeds,” says DiClemente. “It happens when the lawn is thin, usually in hot, dry, sunny areas. If the lawn is stressed, crab grass will creep in.” Soil with high organic content, grass 3 inches or taller, and deep watering can help prevent an invasion. Grubs — the larval stage of some beetles — are the pests that most commonly invade lawns, causing browning and bare spots. Microscopic worms called nematodes, available locally at Mahoney’s Garden Centers or online, can combat them. Lacewings, praying mantises, and ladybugs are other common garden predators; they work on pests that attack broadleaf plants, but are nice to have around in any case. You can find options at Wilson Farm in Lexington, Pemberton Farms in Cambridge, and online at insectary.com. Planting wildflowers such as milkweed at the edges of your lawn can increase the number of predators in the yard and lure pollinators like honeybees and monarch butterflies, which are crucial links in the food chain. Now that you have a nice lush organic lawn, you may as well populate it.